LONDON – June 8, 2016 – Player.me is pleased to announce that its growing social platform has now released on both iOS and Android, making it one of the largest mobile apps built using React native. 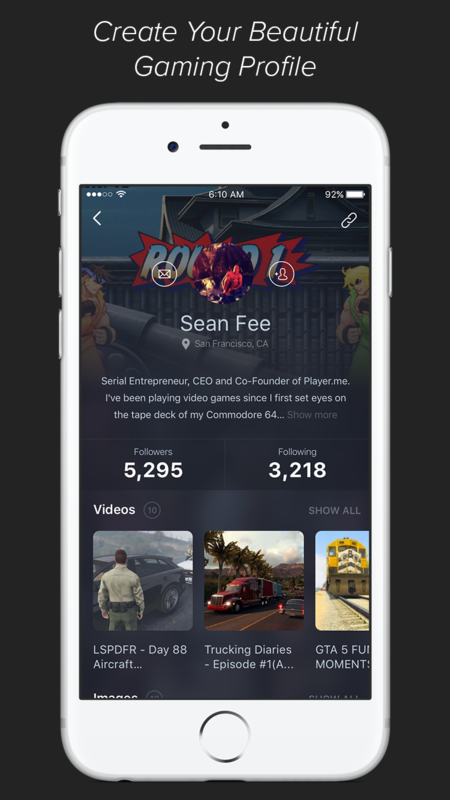 Player.me is a discovery platform for gamers that already has a userbase of nearly 100,000, including high-profile stars like Moosnuckel, Caveman Films and Pamaj. It connects seamlessly with a player’s existing social, gaming and content accounts to show off their activity, content or gaming library and connect them with other like-minded players worldwide. The new iOS and Android mobile applications will allow people to take this unique social experience with them wherever they are. Once you connect to your external accounts on Player.me, updates are automatically pulled into the platform so that your friends, fans or even just similar players can stay up to date with your gaming life. Player.me also has a library of over 50,000 beautifully crafted game pages where you can find or add your own awesome content, and connect with other players or groups. Player.me is the social discovery platform for the gaming community. Since launching in mid 2015, the platform has amassed nearly 100,000 new players, who have helped contribute to a database of over 50,000 game pages. Mynt Labs Holding Limited, which owns Player.me, is a privately owned company founded by Sean Fee and Makara Sok. Please find related assets and images here.